I already have mentioned Tenochtitlan in the context of Senmuth's numerous side projects, but, in my opinion, this album deserves a separate entry. Unlike Senmuth's solo albums, which are mostly inspired by the ancient history of Egypt, Tenochtitlan is focused solely on the culture and history of pre-Colombian Central America. It's not easy to find musicians interested in this particular topic enough to form a band, even in a city as large as Moscow, so all the members of Tenochtilan live in different cities far away from each others, and coordinate their work via internet. This album is very original; at least I can't think of any other band which sounds like this. Yeah, I know of Yaotl Mictlan and some other Mexican "pre-Hispanic metal" bands, but they all play more or less folk-influenced black metal. 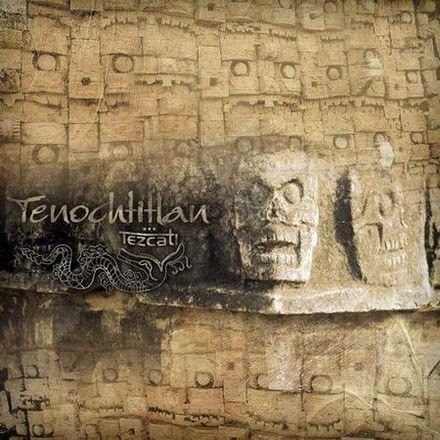 On the other hand, the music of Tenochtilan is based on the same kind of industrial/doom metal which can be found on Senmuth's solo works, with a healthy dose of folk (of course they don't claim it to be the authentic Mesoamerican folk music... but still). The vocals are highly diverse, from growls, to clean (male & female) voice. Same can be said for the languages they're singing in: the lyrics are mostly in Russian, but Mayan, Aztec (Nahuatl), and Quechua languages are also used. To my shame, I'm not very familiar with the history of the Aztec Empire, so I can't comment on the historical accuracy of these lyrics (for instance, I'm not sure if the use of the word "legion" therein is justified - since it comes from the Roman Empire, not Aztec). The quality of production isn't excellent, yet still quite good. If you found this album interesting, there are 3 more full-length releases by Tenochtitlan, but they aren't as rich musically as this one. The latest album ("Сотворение Мира", 2012), however, is better produced than the rest, and more influenced by doom metal, so I think it's their second best release after "Tezcatl".